"I will be forever grateful to eBay for allowing me to present my work to the world. It is how I started. For a small home-based business it is an amazing way to start. I decided to create my own eCommerce website when I felt I had enough followers to create a decent customer base and sell online. As Affordable Designs Canada grew, it was the logical next step for me. Once in a while, I will still use eBay as a way to promote a new character. It is still a great marketing tool." Denis Bastien and his Affordable Designs success story are wonderful, but the path he chose is not so unique. Starting to sell your items on eBay is one of the tried-and-true methods to launch your successful online business. This is exactly what CrazyLister’s founders did in their journey to building a $100,000/mo business on eBay. It’s a fast and easy way to put your product in front of crowds of potential customers, see if it’s selling online well, and test the selling prices. It can be a great school where you will learn how to sell your particular product, how to work with users, how to deal with negative feedback ratings. You may start with a side project, and grow your business into a full-time focus, as cash and experience come. Once you feel that you’re at home with selling online, your eBay business may evolve into opening your own eCommerce store. Hence, you will be able to manage all your sales from a single admin panel. With eBay experience, you will be head and shoulders above most entrepreneurs, who decided to learn the hard way, starting from their own online store instead. If you’re dreaming day and night about online selling, start from eBay account. This step by step guide for beginners will probably not make you an eBay Power Seller right away. But you will have good understanding of how the things work and how to make your first sale on eBay. How is eBay business different from Amazon, Etsy and other major players? It’s eBay’s business model what makes it principally different. eBay is an auction site for buying and selling goods. Potential buyers browse the site to search for products, sold by a vast array of 3rd party eBay sellers, and bid on items through auctions. Bidding lasts for 3, 5, 7, or 10 days, and the buyer willing to pay the highest price for this eBay item wins. Some items have “buy it now” price, so the buyer can stop the eBay auction and purchase the product via eBay immediately, but at a premium. On the contrary, Amazon is providing customers with fixed prices on all products. Also, for about 50% of goods sold there, Amazon is a direct provider. It acts as a seller hub too. 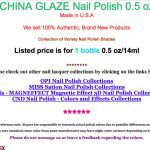 Independent sellers may list their products on this marketplace, but the list of restricted products and categories is huge, compared to the minimal restrictions of eBay store. Etsy is a popular marketplace for 45M one-of-a-kind goods: handmade items, vintage goods and craft supplies. So, unlike quite a universal eBay, it’s for a segment of sellers only: crafters, artists and makers. Fixed price, no auctions — this is what makes Etsy alike to Amazon, but differentiates it from eBay. There’s a definitive guide on how to sell on Etsy in case you decide to start selling there, too. Grind mode on, and let’s hit the books a little bit! What’s the cost of selling products on eBay? The cost of selling on eBay seems clear. At first sight. … all the tough stuff begins when you try to understand how much it eBay will charge YOU. Final value fee is not a simple flat fee either, it depends on the type of your listing (fixed price or auction), item cost, listing time. Don’t try to outsmart eBay and list the product there but sell it outside of eBay — eBay still charges the sellers in this case. You will need to pay a final value fee anyway, say, if you offer or reference your contact information or ask a buyer for their contact information. If you hate the 7th font size so much as I do, and reading theoretical explanations make you yawn, there’s a good practical tool that can answer the cost-of-selling-your-products-on-eBay question — eBay fee calc. This calc implies that you already know what you’re going to sell. Do you? What items to sell on eBay? eBay provides a wide variety of goods that is beyond the typical selection of Target, Wal‑Mart or Best Buy. It has been originally designed as an eCommerce website to sell your stuff that you no longer need. "What’s your trash may be another man’s treasure", eBay states. Yet, it’s no longer a place only to exchange your trash for cash. Together with individual sellers, professional businesses are offering their items on eBay too. Look at the top selling items on eBay to see that businesses feel very comfortable on eBay. This fresh research will also help you decide which products to sell. 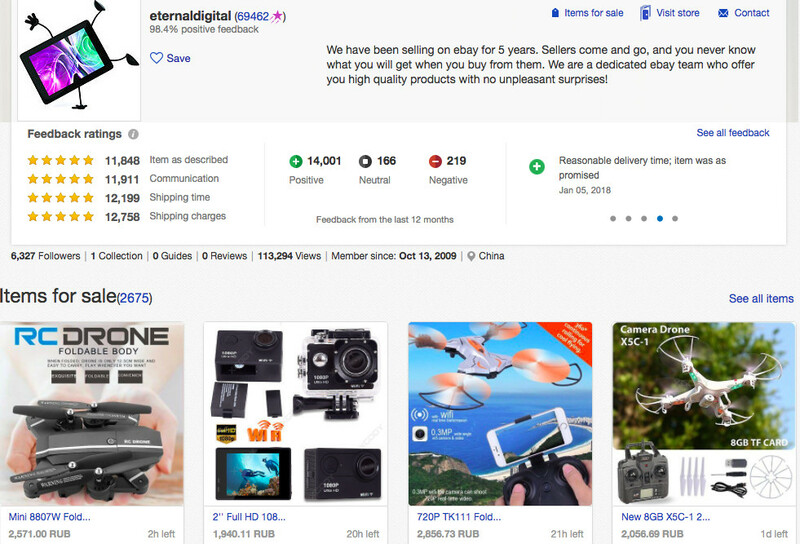 eBay professionals list thousands of items for sale, and it’s not a sole enthusiast but an entire team, selling products in their eBay store. These people analyse, what items are worth selling, and what items don’t sell well. These people check that the sold items are packed and sent on time. These people communicate with the buyers to make sure their experience is great. In other words, eBay is the place where professional businesses are selling new items, wholesale and retail, at a fixed and auction price. 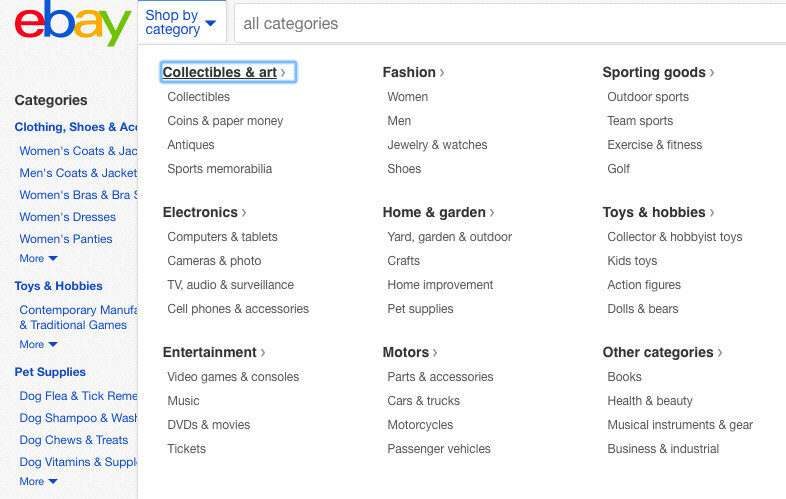 A quick glance at eBay categories shows that you’re allowed to sell almost anything: electronics, apparel, jewelry, toys, collectibles, candies. Even passenger vehicles, trucks and aircrafts, residential real estate, wine and cigarettes, forbidden ⛔ on Amazon, are allowed on eBay. Restrictions still exist, acquaint yourself with them here, in the official eBay seller’s guide. What products are most profitable to sell on eBay? Just like on Amazon, the higher the margin, the easier the shipping, the better. Clothes are very profitable. Many can be shipped simply in an envelope. Little risk of getting damaged while shipping — as a bonus. eGoods is another option that promises a good profit. eBooks and user manuals, downloadable software, audio and video files. Margins should be great as you are selling the single file over and over. Shipping is free as the buyer simply downloads the file. Cheap to ship: compact, lightweight, not fragile. "Evergreen", i.e. not seasonal or holiday-specific items. The product is in demand: top product keywords have 100,000+ searches in total per month, as seen in Keyword Planner by Google. My rule of thumb is a 3 digit price. I love selling items priced above $100, these items usually have enough margins to sustain a business. He also describes their journey to making $100K/mo, selling unbranded GPS. While there are many customers who only shop for brands, there are many other who are happy to go with an unbranded or a small brand item to get a better deal. Where’s the truth? Out there. There are Power Sellers who sell diamonds on eBay for thousands of $$. There are sellers, who made a fortune, selling Chinese knickknacks. There’s no universal path to success. The only absolute truth is that you will never succeed if you don’t try. So get your butts in gear and go choose your product to sell. If you already have an idea of merchandise, but not sure how well it will sell on eBay, researching eBay Completed Listings is a goldmine of information for you. Number of bids shows whether the item is in demand of not. The history of bids in detail show both the starting price and the winning bid — you can see, what the buyers are ready to pay for the item in question. Vice versa, numerous "unsold" completed listings can give you an idea of what mistakes to avoid. Is it poor listing to blame, or is it the item itself that no one wants? Tick "Completed listings" to see all completed listings, both sold and unsold, expired or closed by the seller. To see only sold completed listings, additionally tick "Sold listings"
If it looks like your product has potential, go list it on eBay and see if you can rely on your intuition. One of the first things you will need to do is to setup payments, so this our "next station". Accepting payments on eBay: Paypal account or Merchant Credit card? Payment by personal check, cashier’s check, bank-to-bank money transfers, or money order is allowed only for a limited list of categories like capital equipment, Real Estate, Adult Only, and some Motors categories. For the rest, wire transfer to your bank account is impossible. Decide, which way the extra cash will arrive into your pocket, and let’s craft the eBay listing that sells. So, how to sell stuff on eBay? eBay is a crowded space and the competition is high. 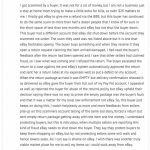 Moreover, eBay itself has to compete for traffic with such monsters as Alibaba or Amazon or Etsy. Hence, listing optimization is crucial for both internal eBay’s “Best Match Search” and external search engines like Google. Relax, we will not dive that deep. Some shoppers buying items on eBay I couldn’t care less what the seller name is. The others actually remember store names — and often shop by stores. One can also choose the seller if he recalls the seller name — "Oh, I remember buying from this Fashion Boulevard store previously!". Last but not least, your store name becomes your eBay store URL, that matters for Google. Avoid nonsense like "fudgr1975" that seems unprofessional. Insert a keyword that describes what you sell, like "Plus_size_wedding_dress"
Add a picture and information about you to assure buyers that you are a legitimate seller who has come here to stay. Image you’re a customer, who are you more likely to buy from? Unless the buyer has opted to search both in the title and item description, eBay only looks for words in the listing’s title. Also, product title has significant weight, when the page is being indexed by Google. Already getting in idea? The title is crucial. Imagine what you would search for, when you need to find an item like yours. Take ‘Delicate sequin-embroidered lace mermaid dress with swirling organza’ — even though it sounds picturesque, no one’s going to search for ‘sequin-embroidered’ or ‘swriling organza’. Try something like “new size 12 white wedding dress’ instead and you’ll cover a more broad range of the search terms the buyers are likely to use. In other words, use general terms and keywords together with the exact product attributes like size, condition, brand, color. But not all the keywords are created equal. How to choose whether to use "wedding dress" or "wedding gown", for example? Or won’t "bridal" be a better word instead of "wedding"? Obviously, "wedding dress" is an unconditional winner. Actually, the simpler the words, the better. At least in the title. Another rule is to avoid spelling errors. Listings with spelling errors sell worse, because they suggest your careless attitude to the entire thing. Isn’t it obvious? No, it’s not for many <sigh>. How about this item designed by "Kelvin Klein"? The fans of Calvin Klein may have a heart attack. Another huge fault of this listing is an unpresentable photo. Like, "how-do-I-unsee-this" unpresentable. 4 Product photos — do it. Do it right. Do it right now. If you’re running an eCommerce business, you may think that you can not afford expensive professional photos shot in a studio. But the truth is, you can not afford disgusting images like the above. Opposite, eye-candy images will skyrocket your sales. You get 12 photos for FREE on most eBay listings. Since your potential buyers can not toy with the stuff sold, upload a sufficient amount of images. Show the scale. Even if you have specified dimensions in the description. Just do that in the images too, and the buyers will send you a virtual thank you. Many of them are “viewers”, not “readers”. Create detailed close-up shots. Joints, buttons, patterns, fabric, etc, that will make your product more palpable. Upload high‑resolution photos. If you want the zoom feature to work, your pics must be 600 x 800px or larger. Use a plain, uncluttered, ideally — white backdrop. Remember that "Kelvin Klein" example, do you want to raise the same feeling in the chests of your buyers? Do not shoot with your flash on, it changes the colors and looks amateurish. Use diffused lighting, better — natural daylight. Capture all angles, sides and facets. If you product has some faults, be sure to show them on your pics too. Say, if I’m reading about some "blemishes" in the product description, but have no chance to "estimate the scale of disaster", I’ll never buy this product online. Opposite, many buyers will be eager to buy the marked-down goods, as long as the price goes down too, and they understand what kind of scratches to expect. For those, who want to shoot like a pro, we have a guide here. It contains TONS of actual fresh info provided by the industry experts. Your product description must be comprehensive yet comprehensible. Is some important info missing? Is it there, but hard to find because of the text is not structured well to be "scannable"? Is it it buried under tons of keywords you stuffed to improve your SEO? No matter why, If the buyer scans the page and don’t find the info they need, the page with your listing will be closed. Hear the sound of your money swishing to the competitor’s pocket? Let’s fix that. Put the most important info at the very beginning of the listing. Keep the design simple. Use bullets, shorten the paragraphs, simplify the sentences. Let the pictures and your text speak for themselves. Avoid unnecessary elements like animation, eyes-leaking-away colors and roller coaster fonts. In addition to "fry facts" about your product, eBay guidelines recommend that you also "include a story about the item, or information about why the item is unique or appealing". NEVER EVER EVER make false or misleading claims about your item. eBay buyers are protected against INAD ("item not as described"), and eBay will always take their side in case a dispute is opened. Compare 2 descriptions below and tell me, which one looks more professional? 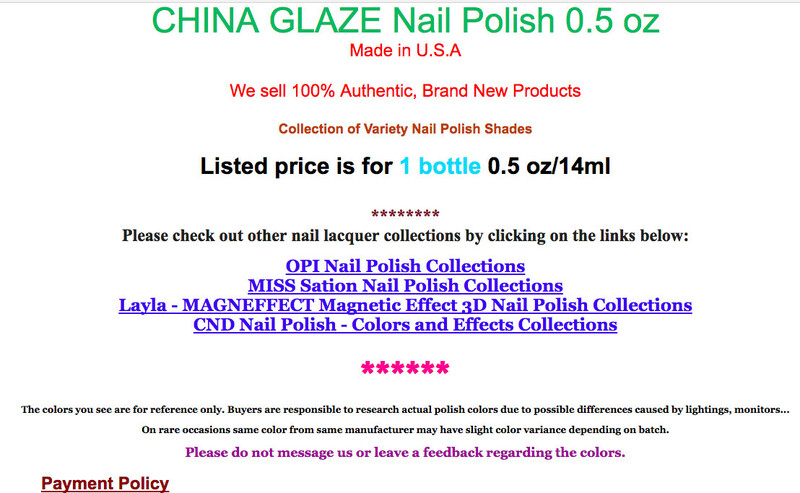 Both Sellers are selling the same product, Chinese Nail Polish. Many eBay buyers use the item specifics filters to narrow the search results. 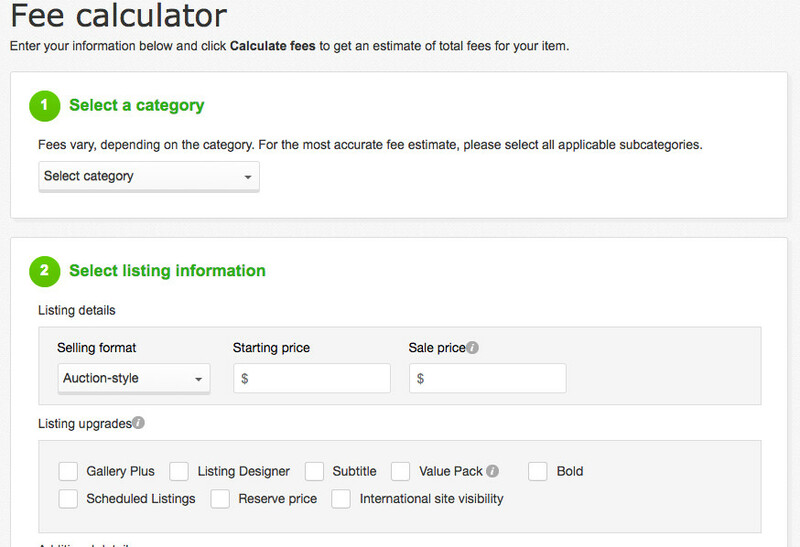 Your listing will get matched, only if you have filled in eBay-recommended item specifics and values. They vary depending on the category. 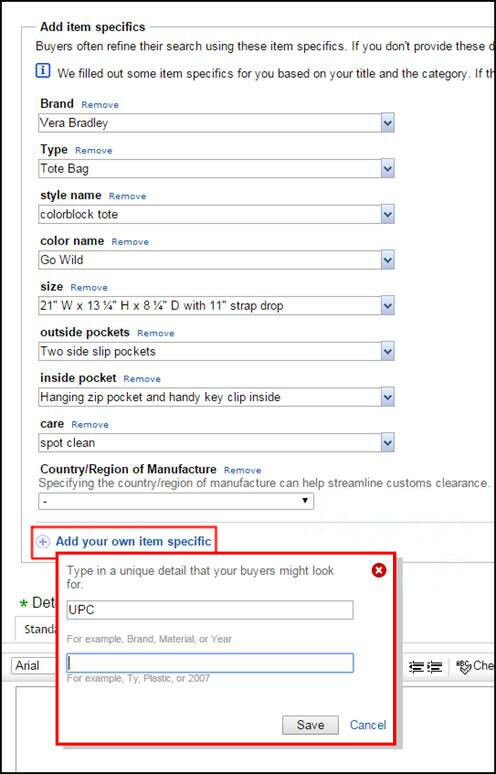 You can also create your own custom item specifics, but note that they will not show up in the left-hand navigation filters on the search results page. 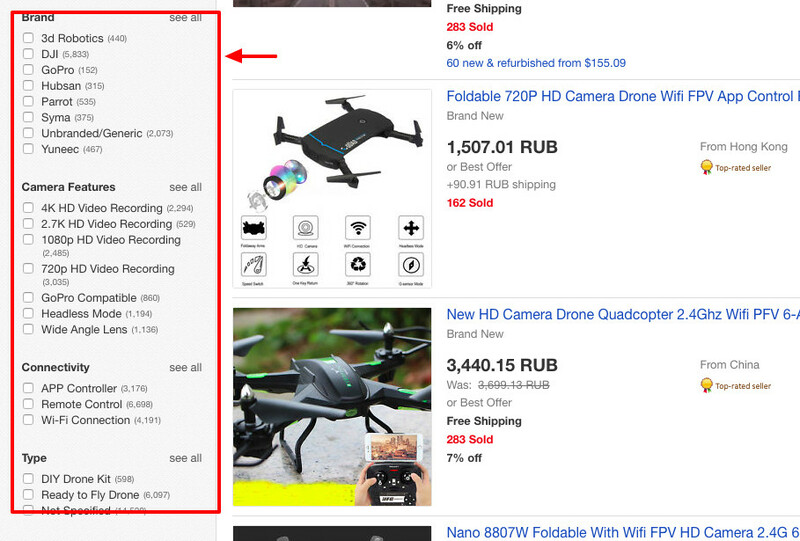 Best Match, eBay’s search algorithm, considers a number of factors. 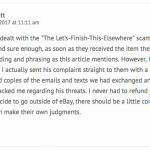 The seller’s track record is among them, according to eBay’s article in the Help portal. In fact, top-rated sellers rank higher. Getting positive feedback on eBay is simple and difficult at the same time. Don’t try to mislead your customers. Ship when you promise, and "Shipping time" will show 5 stars too. Answer questions from your buyers in a timely manner. Be patient, clear, professional and friendly. This is how you get top rates for "Communication". 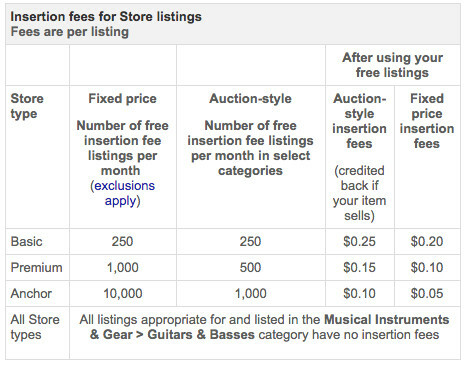 Not all of eBay’s money comes from listing fees. Or did you not notice a highlighted listing on every page, every time you shop? According to Investopedia, eBay sells $2.8 billion worth of advertising every year. Obviously, it will not affect your rank in Google, but the chance to promote your listings on eBay itself is still a good option to consider. Essentially, you will be paying for higher placement in the search results. You choose, what to promote (an entire category or an individual listing). You choose an ad rate between 1% and 20% of the sale price. Just like on Facebook and Google, that’s an auction, and your ad will be shown only if your bid beats another advertiser. Sellers have access to data that shows ad performance and clicks, so you can adjust the promoted listing for maximum performance. You’re only charged if and when a promoted item sells. eBay tracks the buyer’s click on the ad AND keeps "watching" if he purchases this product within 30 days. The quality of listing and images counts. So does customer feedback and seller rating scores. The amount of time remaining before a listing ends also matters. But did you know that the shipping fees and time are also considered by eBay’s search script? You also get such a bonus: Once the item is shipped to a buyer for free, you automatically receive a 5-star rating for your shipping and handling charges — and this rating also raises your listing the search results. You can specify up to 3 delivery services and enable real-time shipping cost calculation. It will return the rates based on the buyer’s ZIP code, the package weight, and the shipping method the customer chooses. You may decrease your postage costs thanks to eBay’s partnership with top carriers. USPS, FedEx and UPS offer discounts you may qualify for. Local pickup can be enabled as an additional option or even as a single possible option. But if you’re serious about selling online, you must understand that you must be flexible, offering several shipping methods to buyers. For your own and your customers’ peace of mind, track your shipments every time you send the item. For sales over $750, always get signature confirmation of delivery. It will protect you against one of the possible types of eBay scam. More tips on how to protect yourself against buyer fraud are below. 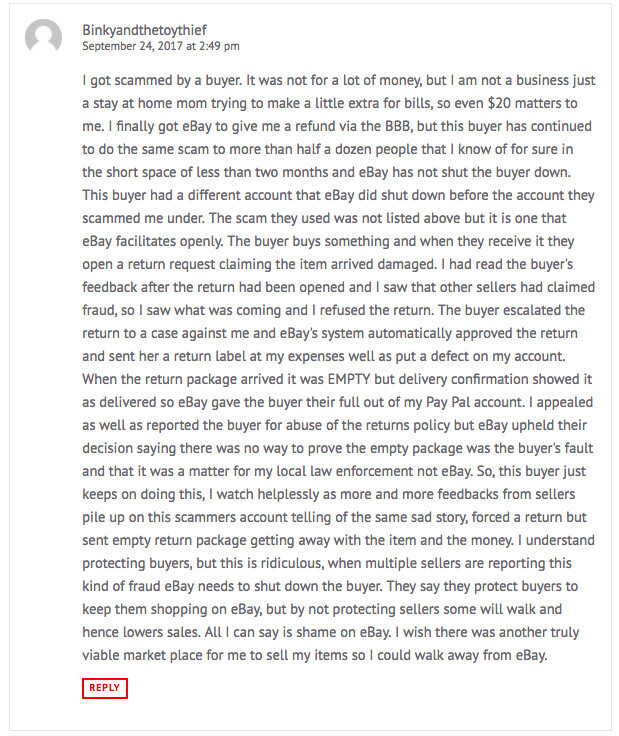 Internet is flooded with the eBay scam horror stories from both buyers and sellers. But given eBay is most likely to take buyer’s side, the seller needs to watch out with “slippery customers”. While an experienced old hand is hard to sucker, new sellers are very likely to become their target. 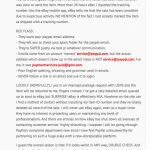 There are several typical types of scam on eBay, and for sure there will appear more ways to fool so vulnerable sellers. But as long as you know about the buyer fraud, you’re becoming a not-so-easy-to-catch fish for them. 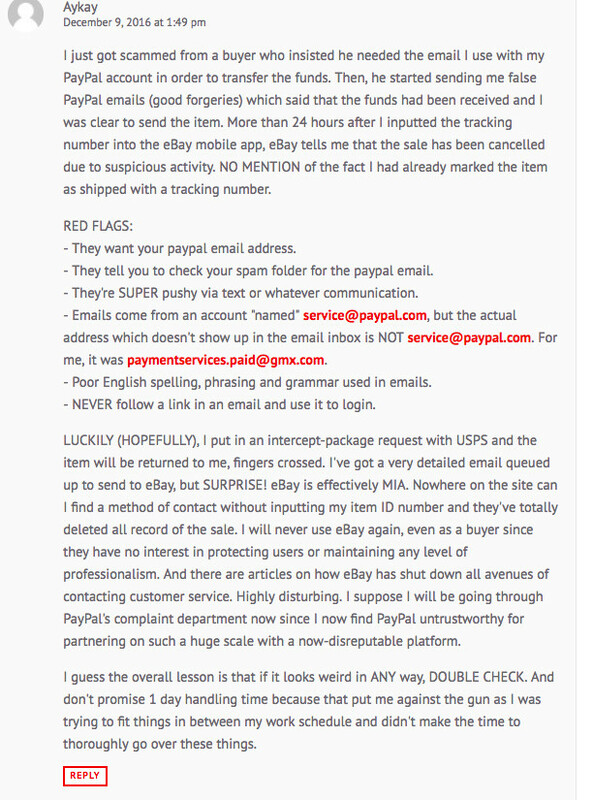 How to protect yourself from Buyer fraud and scam on eBay? If the buyer offers a twice as much money as you ask for your eBay item, but suggests moving the deal outside of eBay, don’t do that. Let’s turn on the logics, who will be willing to pay $600 for the item that can be bought right away for $300? An idiot? Customers are not idiots. Nor are the selles…but as soon as quick cash appears on the horizon, some of them still tend to…hm… disable critical thinking. For transactions over $750, you must have signature confirmation of delivery. In this case you will qualify for PayPal Seller Protection (providing you’re paid via PayPal, of course). This proof of delivery will protect you from the scammers who claim that the item was never received. Photograph the entire process of packing and shipping the item. WAAAT? Agree, that sounds overmuch… till you win the dispute with a scammer who states that you shipped AN EMPTY BOX or a WRONG ITEM. Write down the serial numbers etc when you’re packing the items. (photograph it, too), or you risk to sell a brand new iPhone X, then see a complaint about a defective item sent, issue a refund and finally… receive a cheap replica. Study the customer’s profile before shipping. 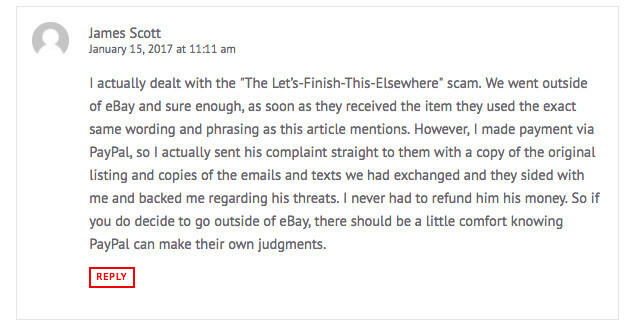 Unless you’re 100% sure it’s a real safe long-term eBay buyer, take a magnifying glass, imagine your second surname is Holmes, appeal to your intuition…and take the right decision. I’m not sure what decision is right in this case. Real customers can look suspicious too. The reason you may be seeing this is that in most categories (like books, camera, clothing, jewelry, fragrances etc), selling limits apply. There are 3 types of them: account limits, category limits and item limits. But the good news is that once you reach the limit for the current month, you’re welcome to contact eBay and the chances are, they will be increased for you. Moreover, based on your eBay account performance, the selling eBay limits may be increased even without your direct request. So if your seller production grows gradually, you may never notice this disheartening eBay’s warning. Reading the success stories of merchants selling on eBay, you may have a feeling that you’re late to the party. That selling on social media sites like Facebook or Instagram or Pinterest is more trendy. That with Amazon, growing so fast, starting eBay selling is not the best idea. The professional sellers listing, say, electronics, jewelry or clothes on eBay are frequent guests of the post office, as the orders come, and come, and come. Millions of customers looking for saving money come to eBay to find the top deals. Look at the figures (source — similarweb) below I just can’t bring myself to tell that eBay’s era is declining. It’s alive and kicking. And your piece of profit pie is already on the table, go help yourself. Start selling on eBay. At least try.